Earlier this year Roku announced a single new product, an excellent $50 stick that was, for the most part, the only set-top box the average person would ever need. Now Roku is back with five new boxes meant to fill every possible user niche—from the person that still has a tube TV from 1995 to the person with a future-proof $1000 UHD set. The Roku Ultra, which will retail for $130, is Roku’s new top-of-the-line set-top box, and for most people it will be entirely unnecessary. It plays back 4K and HDR content, which is quickly coming a required feature, but the Ultra also includes an Optical Audio out for users with a fancy sound system, and MIMO connectivity, for an improved wireless connection between a capable router and the set-top box. The remote even has game buttons for gaming—if gaming on a Roku really floats your boat. The Ultra is the same price as last year’s Roku 4, but for $30 less you can get the Roku Premiere Plus, which will retail for $100, and features the same 4K and HDR playback. It won’t have Optical Audio or MIMO connectivity, but it will be the cheapest set-top box capable of HDR playback. HDR, which lets you see all the details in areas of extreme brightness and extreme darkness, is increasingly common in new shows from Netflix and Amazon Prime, but, until now, you could only use it with apps already built into TVs or via a pricey Xbox One S.
For people who don’t care about HDR, but still want high resolution 4K content, the $80 Roku Premiere 4K should be appealing. It’s the box that directly replaces last year’s Roku 4. Only Roku got rid of the noisy fan this time around, and dropped the price by $50. 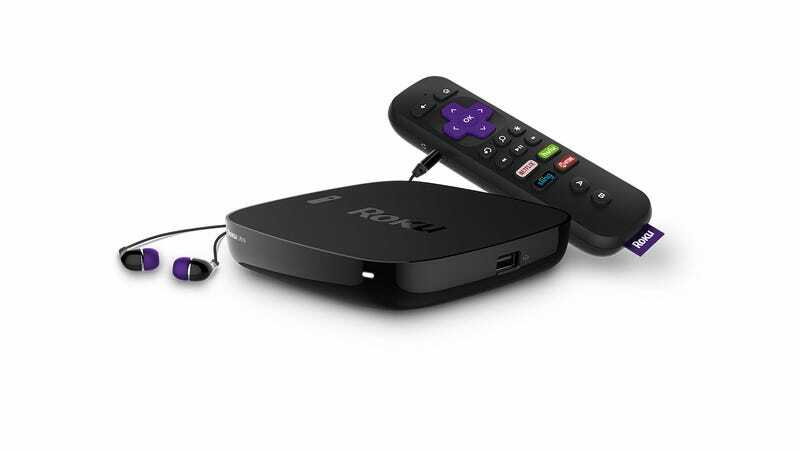 At the other end of the spectrum Roku has also introduced two extremely bare set-top boxes. There’s no audio out via the remote, or voice searching, or 4K content. These two boxes will max out at 1080p, but they’re also about the size of a roll of quarters, and the most expensive one is just $40. The $40 Roku Express Plus will be available exclusively through Walmart and, in a blast from the past, will come equipped with a composite cable. That might seem totally bizarre, but there are a lot of TVs out there that don’t have HDMI in and have been, until now, incapable of playing back Netflix and other streaming channels on anything but an old Wii. The $30 Roku Express is identical to the Roku Express Plus, but will be available at places besides Walmart and will include an HDMI cable instead of a composite cable. Set to compete against the $35 Google Chromecast, the Roku Express is essentially the old Roku 2 crammed into a very tiny box. It isn’t super fast, and it doesn’t have cool features like voice search or 4K playback. It’s simply a box running the the excellent Roku software letting you watch Netflix, Amazon Prime, Hulu, and the rest in 1080p.